Bev Benda: My Coach Bev — The Eagles Do It Right! From my seat in Section 213 at the Alerus Center, the age of the Eagles did not show at all. Of course, they aren’t in their 20s, but if I were rating them on that, I’d rate them as “aging beautifully” — they all looked fantastic. With regard to music, they sounded as good as 44 years ago! They still impart musical integrity, lyrical poetry, angelic harmony and depth. Glenn Frey and Joe Walsh can still duke it out in “dueling guitar licks.” Don Henley hit the high notes, showing effort but without flaw. It was heartwarming to hear Frey and Henley sing “What Ever Happened to Saturday Night?” as they introduced their humble acoustic beginnings. They introduced members one by one, such as Bernie Leadon, who was referred to them by Linda Ronstadt, and Timothy B. Schmit, of Poco fame. I appreciated these introductions — it shows they are valued as human beings, not just musicians. I enjoyed the narrative about the “history of the Eagles,” as it gave me a sense of who they are as people, where they’ve been and how far they’ve come. The fact they have been together off and on for 44 years is an amazing and commendable accomplishment, yet they appeared more grateful than proud. This simple policy enhanced my concert experience immensely. What a joy to not have people flashing harsh white screens in the dark or block my vision entirely with a phone! I credit the Alerus for this as well. When a woman in front of me started texting, security staff was right there to tell her to put her phone away. As I looked over the crowd, I saw very few “cheaters.” I suspect most people were respectful of the directive; after all, if they truly like the Eagles, why wouldn’t they honor their wishes? The other aspect that made the concert fabulous was the volume. It wasn’t bass-pounding, ear-drum blasting, speaker-screeching loud. It was set so perfectly, I could hear every word, bask in each harmony and truly enjoy every musical moment. This also made me wonder, “Why are some concerts so loud I lose my equilibrium?” Quality, not quantity of sound, needs to be the goal. I wish all events (concerts, movies, plays, etc.) would assess the volume setting and the cell phone policy to determine what is best for performers and audience members. 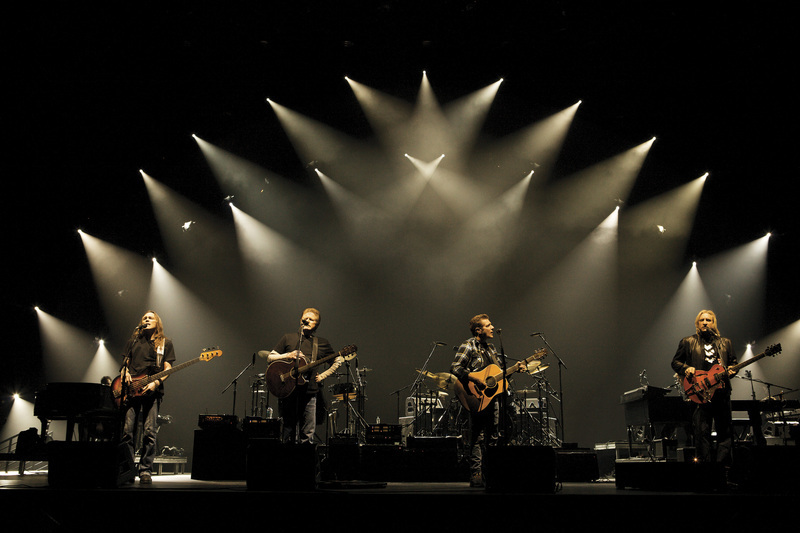 The Eagles concert proved it is possible to put cell phones away for 3½ hours, and that texting truly can wait. On another topic, if you are wondering what my favorite Eagles song is, I had two before the concert — and five after. That’s what a live concert does to a person. Thank you to the Eagles and the Alerus for a great evening! Excellent review of the concert. I agree with everything. Your assessment of the volume was perfect. I, too, was thrilled to hear the perfect harmony. Ditto to all you said about the Eagles concert! They made me feel like they valued each of us who came. I especially liked how at the end of the concert they lingered and walked across the stage waving at everyone. Class acts all the way!